Well, I've got some down time from work, so I thought I'd add more uninformed opinion to the blogosphere. I was just looking at some shots of the new 9-3 SportCombi, and it was a big relief to see that Saab has spared this car the indignity suffered by the 9-5 with its latest rework. It baffles my mind how car companies can put something on the road that is so flat-out ugly. Sales of the 9-5 have been on the outs since the intro of the redone svelte, attractive and spacious 9-3. So it's only natural that GM would try to reinvigorate the model with the slick rework. Well, this was not the way to do it. I don't think there's much I need to say about this design, though maybe I'll just add the thought that it's trying WAY too hard, and that if you haven't seen it, believe me, it's even less attractive in person. And take a gander at the rear end. Nowhere in this part of the design is there anything that might be called "coherence". It's true that beauty is in the eye of the beholder. And I guess maybe I should ask one of the 243 Americans who bought one in April. 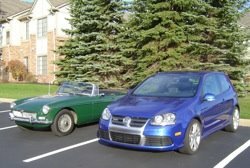 You've touched on a subject close to my heart... you've likely discerned I'm a Saab guy (if you've ever followed the link to my sad little blog). Are the shots of the new 9-3 you saw "official", or are they spy shots? Unfortunately, (according to some members of Saab Central), the latest round of spy shots for the 9-3's "freshening" shows the vehicle with the chrome outline rings covered in black tape. In other words, from what I understand, Saab/GM is giving the 9-3 a similar front end treatment to the 9-5 you've featured. Horrific. It's supposed to follow the styling theme of the Aero-X concept. It just doesn't work on their current production cars. We own a 2001 9-5. We bought it new, it was actually a fairly modern vehicle back then, and the first-gen styling is my favorite look for the 9-5. Our sedan is comfortable, competent, and it style has held up OK. I still think it looks good (though ours could do with some sportier wheels). The 2nd gen (i.e. 2002 facelift) has grown on me, but the current iteration 9-5 is pretty terrible looking. They slathered the front end with an ugly bunch of shiny chrome and black plastic, which is ugly in its own right, and out of character with the 10 year old shape/design of the body. The current 9-5 is the most powerful Swedish Saab ever built, with 260 HP trying to get to the road via the front tires. As I mentioned in my comment to your Acura post, FWD is not a sought-after (near-) luxury drivetrain. I'll bet the torque steer with 260 HP is terrible, it's often noticable in ours with 185 HP. GM needs to help Saab out. They're doing Saab no favors by letting them languish with a 10 year old 9-5, and a 5 year old 9-3, with the 9-5's replacement not on the horizon until 2009 at earliest. Of course, maybe they're just following Saab tradition... The original 900 series was in production for 15 years. At least they never did that horrible nose/tail treatment on the 900 like they've done to the 9-5. I stand corrected about the chrome face of the 9-3... I've just seen the production photo released by Saab, and it doesn't have the silver "mascara" of the 9-5.